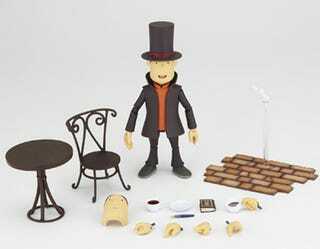 We're sorry we showed you that Professor Layton figure last year. It may have led some of you to try and buy one. We're sorry about that because you should probably check out this one instead. It's much better. This baby is made by masters of the posable action figure, Kaiyodo, and is part of their line of Revoltech figures. Included with the good Professor will be everything you see above, which is more than enough for you to craft some kind of puzzling diorama out of. It'll be out on March 15 in Japan, and will retail for ¥2400 (USD$26). You want one, it's a Revoltech figure, plenty of comic and toy stores in the West import the things.